of who you are and your relative identity, if not the fundamental reality. Hence you update your Facebook status with entries such as ‘agliff, agonous and agowilt’ or even ‘anabiosis’. These are archaic struggles, as is our general want when in the disposition of a human form seeking that elixir of immortality or a sense of illumination in the box office smash hits; the Holy Grail, Nirvana, Moksha and the rest of the spiritual shelf promising you a lovely cartwheel to the afterlife, with no stopovers in the Bardo. 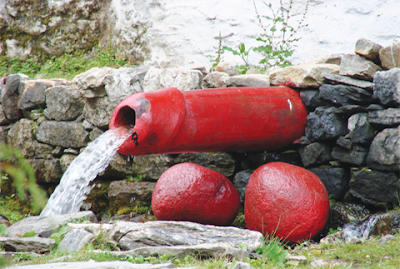 This is where the Bhutanese will use whatever spiritual tools are available to find a path on the shortcut to paradise. The gilded gold-tanned-solar powered Manis or prayer wheels stuck on dashboards in cars, blessed relics hanging from the driver’s mirror, anti-evil-spirit-warding-scriptures and malevolent removal devices adorn the residence, and the couple of odd shamanistic rituals conducted to empower the mind and the body for compassionate reasons is regularity. Much like the prayer flags that blow at the whim of the wind, the Bhutanese go about their Yin and Yang; nothing is ever enough. Got a government, lodge complaints. Got democracy, throw accusations. “Someone making money?” Lambast the man. You must be a crook or a sycophant. “The PM is trying to garner good PR for the country?” Must be for some secret-selfish end. “The Opposition Leader is objecting?” Must be to enhance his political career. “You are in the civil service?” You must be corrupt. “A Rinpoche is giving teachings?” Must be to hoodwink the straight devotees. “You work in the media?” You must be concocting stories for some patron. “Making a foray in politics?” Has to be the perks! The list is expansive, and that is perhaps one reason why the sage always tells you to shut up, sit down and ‘breathe dog, just breathe’. I’m a full-bloodied Bhutanese (as far as full bodies and red blood cells go). My father (RIP) hails from Paro, a western region known for red rice, secret-mystical hidden realms, and natives with more than a chip on their shoulders. In short, they are bold, blunt, and sure, oozing obvious machismo. My mother sprang from Bumthang, a central eastern highland, also known for its spiritual treasures and of late, anything to do with cheese, brewed beer, honey, fruitarian drinks and resorts and temples and festivals, (the midnight Naked Dance is something else). The folks are known to be gentle, (though unchecked aggressions will incur instant reprisals). Both valleys are beautiful, often cited as the two most beautiful valleys in the kingdom’s northern belts. The offspring of such unions are termed ‘Batsaa’ – suspiciously sounding like the dreaded inglorious basterd (deliberately thus spelt by Quentin Tarantino to make it easier for Google to Google is one theory. The film itself is a wonderful take on Nazi Germany, using satire to bludgeoning effect. The standout performance is of Herr Christoph Waltz, (a delightful Austrian actor with a rich penchant for metaphors) as SS Col. Lans Handa, a classy, cultured, multilingual and sadistic Jew hunter (critics hailed his performance as the most delicious evil villain seen by moviegoers since Javier Bardem’s Anton Chigurh in “ “No Country for Old Men” and Sir Anthony Hopkins’ Dr Hannibal Lecter in “Silence of the Lambs.” (Incidentally, both of those roles were Oscar winners.) But wait! Where is this going? Ah! The Bhutanese Batsaa! Now knowing the Bhutanese and being acutely aware of their natural appetite for intra-regional rivalry, the term Batsaa was most likely concocted to remind you of the English description and its meaning. Either way, the thing is if you happen to be one, you’re a goner! And, as you get a couple of more full moons and wrinkles stacked on top of your gravitas, the more agonizing your Bhutaneseness becomes. The travel brochures tell you that it’s an affordable Shangri-La at a reasonable price (considering the GNH landscape and culture); and one of the selling pitches is the people’s section. 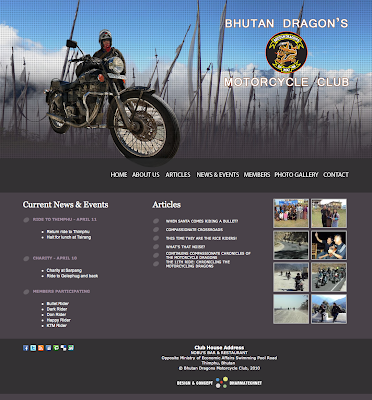 A sampling: Bhutan’s population is in many ways one large family (a la Corleone with fiefdoms and territories). More than 90% of the people live on subsistence farming, scattered in sparsely populated villages across the rugged terrain of the Himalayas, (the rural-urban brain drain and brawn frown is omitted, plus the fact the 1% rich-ring own everything). With rice as the staple diet in the lower regions, and wheat, buckwheat, and maize in the other valleys, the people farm narrow terraces cut into the steep hill slopes, (although in major towns junk food is replacing traditional fare and farmer’s wanna chill out too from what is fruitless hard labor). Bhutanese communities settled in the valleys with limited communication in the past (now universal connectivity is almost within reach and cell phones are must have accessories, along with crime and pollution, deepening chasms between the haves and the will-never-haves). It is for this reason that the sense of individuality and independence emerges as a strong characteristic of the people (although a herd mentality with knee-jerk reactions is another typical trait surfacing at the slightest provocation, and a sudden loss of memory when folks you know wind up in courts and prisons is not uncommon). 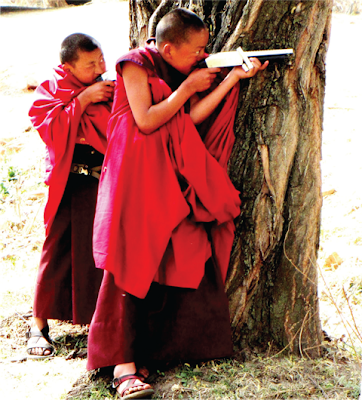 It is for the same reason that, despite the small population, it has developed a number of languages and dialects (and none can read and write Dzongkha, the national language, apart from monks and the handful with political aspirations, and developing those lingos were required to keep the family jewels secret). The Bhutanese are, by nature, physically strong (5 foot 7” is the average man’s height, and fiercely independent (boys as young as 30s and 40s still live in with parents), with an open and ready sense of humor (until the joke and the criticism is on them). 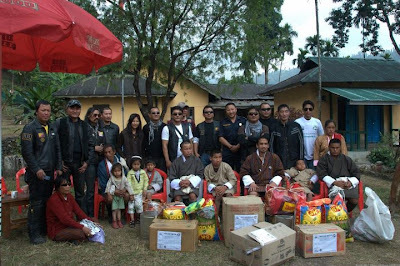 Hospitality is an in-built social value in Bhutan (the more so when the guests are potentially loaded). Bhutanese people are also highly organized and orderly (together with a mysterious inability to queue up, especially if they happen to be in banks and hospitals). The beautiful kingdom comprises a mosaic of different peoples (that do not get along), who continue to live in valleys isolated from one another (out of choice) and the outside world (a physical phenomena) by formidable mountain passes (now converging in major towns with greed as the determining factor). Differing ethnic groups are also distributed according to the varying environments (the nomads of the north and the east; one is increasingly going Chinese and the other, very Indian). It is possible to divide Bhutan’s population into three broad ethnic groups, though the distinctions blurs in places (it’s a sexually liberated society that pretends to be conservative and knows love is the nectar of the gods). Nepalese farmers, who arrived in the country at the end of the 19th century, inhabit Southern Bhutan. They also brought Hinduism with them as well as the Nepalese language, which is still spoken today over much of Southern Bhutan (as is Sharchopkha in the east, Bumthapkha in the central highlands and accented Dzongkha in the west. A point to note: if they are educated, English becomes their mother tongue but without the allegiance to the Queen of England). The one universal exception is the use of the southern tongue when playing Carrom, a table with four corner-holes and 18 coin-like black and whites called goatees. 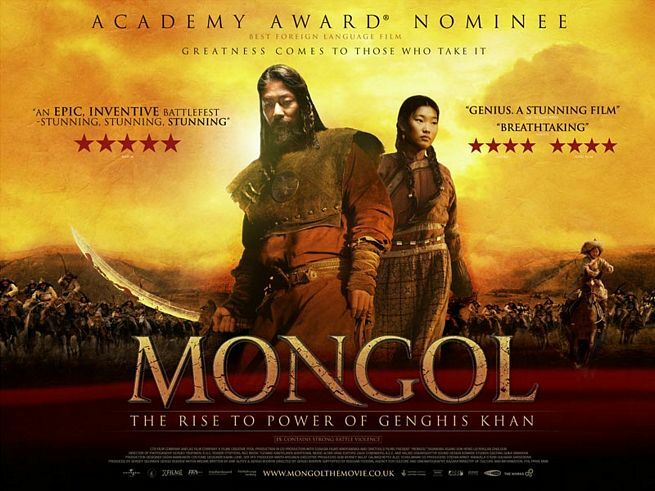 Ancestry is traced back to the great Khan of Mongolia himself, Genghis Khan, and every Bhutanese is a Drukpa (Dragon People, also reflected in the name of the country – DrukYul – Land of the Thunder Dragon). For a country where everything flies – Dragons, Garudas, Ravens, Black Naked Cranes (yes – here they go naked), and Tigers – there is one airline with two planes. The in-flight peanuts are to die for! Their Majesties the Kings are Druk Gyalpos (Dragon Kings), ironic, that such a kingdom has had truly enlightened monarchs! The majority of the Bhutanese breed cattle and cultivate the land and dwell in spread-out valleys (at the time of going to press, they are increasingly becoming landlords and real estate barons at the cost of banished hamlets and fallow fields awaiting the next bulldozer, crane, or excavator transforming traditional settlements into urban GNHish buildings). The Northern Himalayan Zone, over 3,000m, is the haunt of semi nomadic yak herdsmen. They spend most of the year in their black tents made from yak hair and hide, but also possess dry-stone walled houses, where they spend the coldest months of the year. These are also used to store their goods. Additives to a diet composed mainly of yak milk; cheese, butter, meat, barley and winter wheat, plus a few root vegetables grown in small fields. (And thanks to Cordyceps, the fungal worm-plant that appears seasonally in their region, which costs a fortune and with the Chinese along that border, with their aphrodisiacal obsession, business is good. Here they consume anything and everything ‘Made in China’). So do not be alarmed when you do the Snowman Trek and find yourself in a yak herder’s tent with Chinese décor, satellite TV, noodles, Chinese cigarettes, dishes, and a host of electronic goods and of course, Kung Fu films). The Sharchops are believed to be the earliest inhabitants, a mix of Indo-Mongolian genetics (exact origin unknown), with DNA association to Tibet and the Indian Northeast. At present, they live in the east of Bhutan (now spread like wild oats all over the kingdom), drink from the age of three; are related to everybody and, to keep an eastern nomadic version parallel to the western nomads, there are the Brokpas. They are a handsome race. They wear leather pants (a la Jim Morrison) made of hide, wear their hair long, and could pass as the American Sioux if Dances with Wolves Part II ever gets made. But, irrespective of what gene, race, region or religion they come from, they are quintessentially Bhutanese - that is to say the Bhutanese are a breed apart. Archery is touted as the national sport, though in reality we all know its Yum. Yum is a Bhutanese dice game, a.k.a. Parala or Parashow (depending on your region). begins. Gossip traces its source here, along with hearsay and rumor. It’s covert. It’s overt. It’s basically Spy Vs Spy from MAD multiplied a thousand vicious times. When one races ahead, the others gang up, hence the one who is able to blend the wily fox and the calm owl generally wins the game. It can take an hour sometimes just to wrap up one single game, exactly because each player is playing with the other player, who is playing with you! As in the game of Yum, so it is with everything else. I’m proud of my lineage. Proud to be Bhutanese, but, as I confessed earlier, it is more often than not an excruciating affair. Back in school I used to wonder why we had such a small population – and it had to be pondered as the two most populated countries in China and India border the kingdom. Even Bangladesh and Nepal, close by neighbors, have 162,221,000 and 29,331,000 respectively. Even the Maldives, the smallest country in the subcontinent, has a whopping 396,334 Maldivians. There are barely 700,000 Bhutanese. Thank god for that! Just the prospect of seeing and having a Bhutanese population as big as one of these neighbors is scary. Perhaps Guru Rinpoche had a plan. This is a manageable lot (and the imagery of god dusting his hands off after making all kinds of men, and then suddenly going, ‘oops!’ I forgot one species! Hence he puts in the scraps left on the table and molds this type he categorizes as “Bhutanese and Dangerous” and drops the first batch in the eastern Himalayas). The reason it is excruciating is because they are Bhutanese, which is to say they are the happiest people with the biggest complaints. They drive home from work in a journey that takes five minutes yet they will run you over on the road and keep going, with perhaps a middle finger sticking out of the window, telling you what the heck are you doing walking on the roadside? In a hospital, outside the doctor’s chamber, they will pull you, push you and shove you out. The idea being that his ailment is somehow more important than yours. The bank is another place where this syndrome comes into full flourish. The idea being that he needs the money more than you do. And let’s not talk about the rush hour blessings from Lams, Trulkus and Rinpoches. They get fatal. Sun Tzu’s advice to keep your friends close but your enemies closer is a no-brainer here. The opposite holds water. Thus it’s keep your enemies close, but people, who care about you, that much closer. 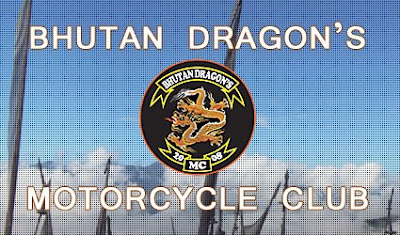 You may take the Bhutanese out of Bhutan, but you’ll never be able to take Bhutan out of the Bhutanese.